Representatives from Bremer Bank presented a check for the $100,000 challenge grant awarded to Hospice of the Red River Valley (HRRV) earlier this fall. HRRV has successfully raised the donations needed to receive the challenge grant, which will be used to fund new hospice-specific patient care software. 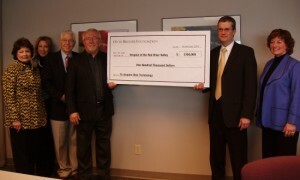 The challenge grant was designed to provide matching funds for Gifts of Light of $500 or more received by Hospice of the Red River Valley before Dec. 31, 2010. Due to the generosity of the community, HRRV met the goal on Dec. 10, 2010, three weeks ahead of the deadline. The funds will be used for new hospice-specific patient care software, designed to increase accuracy and eliminate redundancies for staff while enhancing communication with patients’ families. The Otto Bremer Foundation has a strong history of supporting Hospice of the Red River Valley, with grants received since 1996 totaling more than $300,000. Otto Bremer Foundation grants are made possible by the special ownership arrangement of the Bremer Banks. The Otto Bremer Foundation is the majority owner of the Bremer Banks, and Bremer Banks delivers profits to the Foundation. The Otto Bremer Foundation uses those profits to make grants to nonprofits all across the Bremer states of Minnesota, North Dakota and Wisconsin.